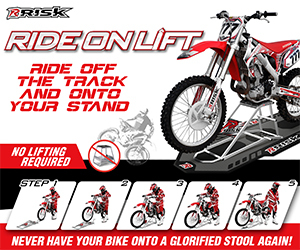 Cover Photo: GNCCRACING.com – Check them out! SOCIETY HILL, S.C. (April 14, 2019) – The 2019 AMSOIL Grand National Cross Country (GNCC) Series presented by Specialized, an AMA National Championship, continued Saturday, April 14 at Moree’s Sportsman’s Preserve in South Carolina with the 4th Annual CST Tires Camp Coker Bullet. Maxxis/Fly Racing/Ye Olde Cycle Barn’s Chris Borich would battle through the field capturing his first overall win of the season. When the race began and the green flag flew it was WFR/GBC/Fly Racing/Yamaha’s Walker Fowler grabbing the $250 Wiseco XC1 holeshot award and leading the riders into the woods. As the race continued on Fowler would swap positions multiple times before Borich made a last lap pass for the lead. Fowler would hold onto second overall coming in 12 seconds behind Borich. JMR/Maxxis/Elka/Moose Racing’s Jarrod McClure put in another great ride in South Carolina this weekend finishing third overall. McClure started the day in third, but after falling back to fourth place on lap 3 he would have to put his head down and push. By lap four McClure found himself back in third overall and would make his way through the finish line as the checkered flag flew. After a disappointing race in North Carolina Yamaha/AmPro/Action Offroad/GBC’s Cole Richardson was back to battling for a podium position this weekend. Richardson would hold fourth overall for majority of the day, but was engaged in a battle with McClure for part of the third and fourth laps. Ultimately Richardson finished the day fourth overall, and currently sits fifth overall in the points standings. LanMills XC/CST Tires/Houser/Yamaha’s Brycen Neal came through second overall at the start of the race, and even held the lead as the riders came through on the second lap. However, Neal would fall back to fifth overall and remain there as the two-lap card came out until the checkered flag was waving. Neal remains fourth in the Overall National Championship Standings. Just behind Neal was OBOR/Moose Racing/Parts Unlimited/McGill Mafia’s Adam McGill coming through the pack. McGill had a consistent day running sixth overall for the duration of the two-hour race at Moree’s Sportsman’s Preserve. McGill continues to hold onto third in the points standings as the series heads into a small break before returning on May 5 and 6 in Indiana. 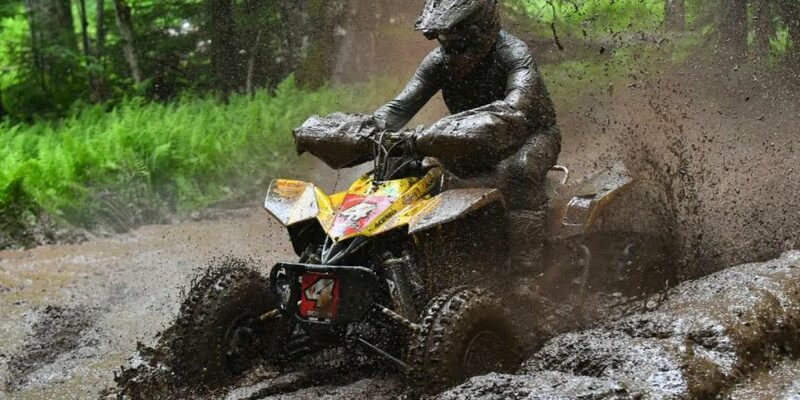 Maxxis/Ithaca Recreation Sports/Fly Racing’s Hunter Hart and Ryland Johnson Racing/GBC Motorsports/Ye Olde Cycle Barn’s Westley Wolfe were locked in a battle for seventh overall as the race wore on. Hart would manage to hold the seventh place position for the majority of the day, but Wolfe would make a pass as the white flag came out. Hart would put his head down and push, making the pass back on Wolfe for seventh overall and remaining there as they came through the finish. Wolfe would hold onto eighth overall. Pierce Performance/Moose Racing/Spider Graphix’s Cody Collier made the pass for ninth on GBC/Fly Racing/HMF/Yamaha’s Johnny Gallagher after the first lap. Collier would hold onto ninth in the XC1 Pro class followed by Gallagher, who rounded out the top 10 in his class. Collier would finish 10th overall, while Gallagher came through in twelfth overall. In the XC2 Pro-Am class it was Matthew Lindle jumping out and grabbing the $100 All Balls Racing holeshot award. Nevertheless, it wouldn’t take long for Pierce Performance/Maxxis/Waynesburg Yamaha’s John Glauda Jr. to lead the way. Glauda Jr. would battle through the South Carolina woods and sand as he made his way around to his fourth consecutive win. Jordon Poplaski earning his best finish thus far in the season with a second in Pro-Am. Coming in and earning the third place position on the day was LanMills XC/CST Tires/Moose Racing’s Drew Landers. Rounding out the Pro-Am top five was Ben Kowalewski and Wyatt Wilkin. Kevin Yoho took home CST Tires Camp Coker Bullet GNCC top amateur honors with a Vet A class win and 16th overall. Jeffrey Pickens came through second in Vet A and 21st overall, while College A’s Dylan Walraven came through 22nd overall to round out the top amateur podium. Can-Am/OBOR Tires/Derisi Racing’s Landon Wolfe earned his fourth-straight win of the season in the 4×4 Pro class as well as the 10 a.m. overall win. However, Can-Am/CST Tires/Tire Spine’s Dwight Pollard was right behind Wolfe for majority of the race gaining on him, but after coming through the finish looking down at his machine it appeared a mechanical issue may have been arising. Pollard would still finish in second overall, with Schoolboy Sr. rider Layne McCormick following him in third overall. In the WXC class, GBC Motorsports/Yamaha/Fly Racing’s Traci Pickens found her way to the front of the pack to clinch her third-straight win of the season and also finish 10th overall. Coming through second in the WXC class was Ye Olde Cycle Barn/Pierce Performance/Hammer Nutrition’s Alicia McCormick, this was Alicia’s fourth consecutive podium appearance. In her third WXC race, Hannah Hunter came through to finish third and round out the Camp Coker Bullet GNCC podium. As the first race of the day took off at 8 a.m. it was Kentucky’s Damien Hawkins coming through timing and scoring first overall and in the YXC1 Super Mini Sr. class. Following Hawkins coming in second overall in South Carolina was Bryce Husband. As the riders continued to come through the finish it was Charlie Stewart coming in third overall from his second row start in the YXC2 Super Mini Jr. class. This marked Charlie Stewart’s fourth-consecutive YXC2 Super Mini Jr. class win, but his first appearance on the youth overall podium. Parker Henderson came through fourth overall and third in the YXC1 Super Mini Sr. class. Nicholas Dearing rounded out the top five overall, and second in the YXC2 class. The Micro ATV’s were the first of the 50cc machines to take off in South Carolina, and as the checkered flag flew it was Bodie Buckhannon from West Virginia taking the overall win and his MXC1 class win. Following Buckhannon was Ryder McCormick who earned his fourth straight 90 Stock (8-11) class win, and making his second appearance on the overall podium. Khyler Davis came through third overall and took home the MXC2 class win, and continues to lead the way in the class points standings. The 2 p.m. ATV Pro race was broadcast LIVE in its entirety on RacerTV.com and can be viewed as archived video online by visiting the GNCC LIVE page online. A highlight show featuring the event will air on NBC Sports Network on Saturday, June 23 at 2:00 p.m. The 2019 GNCC Series returns on May 4 and 5, with the Yamaha Racing X-Factor Whitetails GNCC in Peru, Indiana.